Home > Community • Events • Fun Stuff • Restaurants > Who’s Ready for Patio Dining on April 1st? As of this writing, the forecast for Monday, April 1st is 43 degrees and sunny – we’ll take it! Get ready for bright skies, people watching, and delicious food. The following restaurants offer outdoor dining and are conveniently located in the heart of Saratoga Springs on Broadway: The Blue Hen, Boca Bistro, Cantina, Forno Bistro, Morrissey’s, Pig N’ Whistle on Broadway, Salt & Char, and The Wine Bar. The Blue Hen, located at the historic Adelphi Hotel, offers an elegant fine dining experience with mouthwatering steak and seafood options – they even have a separate sushi menu. For more a casual bar-like vibe, you might try the Pig N’ Whistle, which features high quality pub cuisine with an Irish flare. 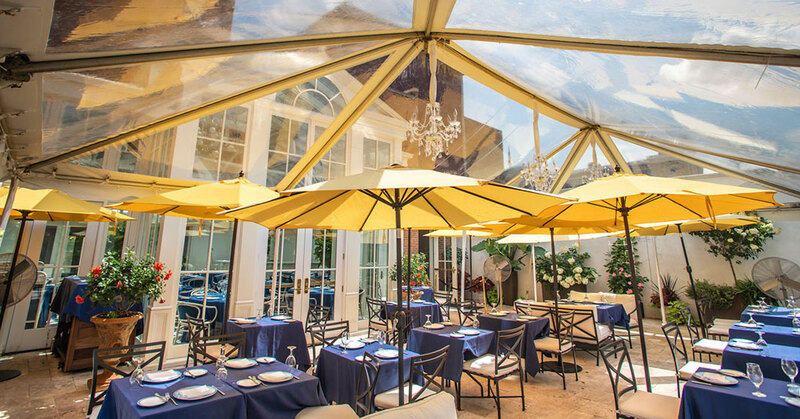 There’s truly a patio dining experience for everyone in Saratoga, and don’t think you need to stick to Broadway, either. Sink your teeth into the half-pound burgers at The Barrelhouse on Beekman, enjoy a stunning lakeside view at Dock Brown’s, or relax under the covered veranda at Prime at Saratoga National. Also, Wheatfields is hosting their annual Patio Party regardless of what the weather does. Note: Depending on the weather and other factors, some establishments may choose not to open their patio on April 1st. It’s safest to check with individual restaurants beforehand.